(Bloomberg Opinion) -- Jamie Dimon, chief executive officer of JPMorgan Chase & Co., released his ambitious letter to shareholders on Thursday. The roughly 23,000-word opus took on a dizzying array of controversial subjects, including artificial intelligence, privacy, education, health care, infrastructure, immigration, student loans and the relative merits of capitalism and socialism. Dimon’s observation may seem banal. After all, no bank CEO wants to relearn the lessons of the 2008 financial crisis, and regulators will no doubt make every effort to ensure that banks are prepared for the next downturn. But that same defensive posture may have a less obvious impact on markets. Namely, it could deliver a boost to long-suffering value investors. The conventional wisdom is that value stocks outperform during expansions and underperform during recessions, which makes intuitive sense. Value stocks generally represent companies that are in decline or struggling to grow. For those firms, a strong economy can be a big help and a downturn can be a harsh blow. 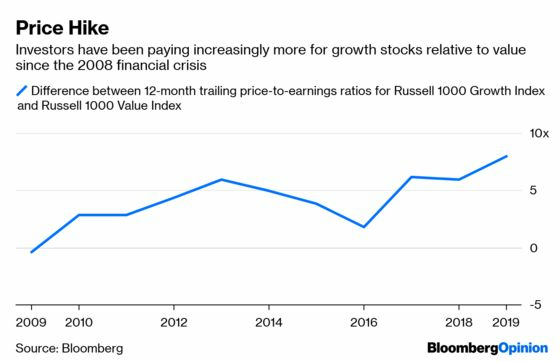 The problem for value investors is that the last decade has been a painful exception. The current economic expansion will be the longest on record in a few months, and yet growth has easily beaten value during the period. 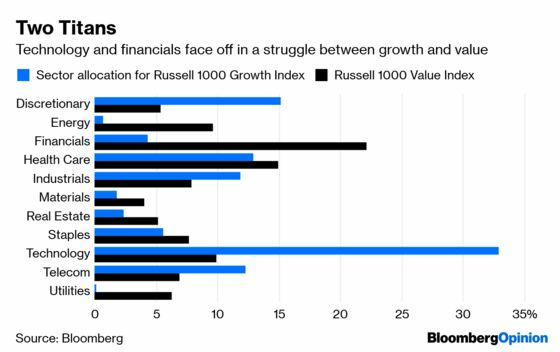 The Russell 1000 Growth Index has outpaced the Russell 1000 Value Index by 3.14 percentage points a year since July 2009 through March, including dividends. A big reason value has lagged, however, has to do with the banks. The financial sector represents 22 percent of the value index, by far its biggest sector bet. By contrast, the sector makes up just 4.3 percent of the growth index, its seventh-largest sector exposure and a fraction of its 33 percent stake in the technology sector. Unfortunately for value investors, the last decade has not been kind to financial firms. Many of the forces that Dimon sees constraining banks during the next downturn are the same ones that have constrained them since the financial crisis. Banks got into trouble during the crisis primarily because they piled on leverage to boost profits, but they’ve since learned their lesson. The debt-to-equity ratio of the S&P 500 Financials Index shrank to 152 percent at the end of 2018 from 563 percent in 2007. Not surprisingly, profits have shrunk, too. It’s a stark contrast from the technology sector, which has enjoyed a historic decade. The average profit margin for the S&P 500 Information Technology Index has jumped to 15.8 percent since 2009 from 4.7 percent during the period from 1990 to 2008. Profitability, as measured by return on equity and capital, notched record highs in 2018. And, yes, leverage helped. The technology index’s debt-to-equity ratio tripled to 79 percent at the end of 2018 from 28 percent in 2007. After a decade like that, value investors are no doubt dreading the next downturn. But the flip side is that banks’ newfound caution may come to their rescue. It wouldn’t be the first time value bucked the conventional wisdom by holding up better than growth. In fact, the environments leading up to the two bear markets in which value outpaced growth by the widest margins resemble the current one. In the years leading up to the 1973-1974 bear market, investors chased growth stocks they thought would never disappoint, the so-called Nifty Fifty, driving up their prices to absurd levels. In the ensuing bear market, value beat growth by 23 percentage points, according to numbers compiled by Dartmouth professor Ken French. More recently, investors piled into growth-oriented dot-com stocks in the late 1990s. In the bear market from 2000 to 2002, value beat growth by 28 percentage points. You see where this is going. Investors have had little trouble choosing between highflying technology companies and boring banks over the last decade. 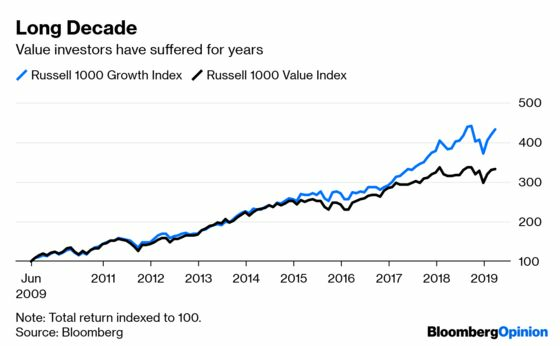 As a result, the growth index is now more expensive than the value index by the widest margin since the dot-com era, as measured by 12-month trailing price-to-earnings ratios. Value investors have had little reason to cheer Dimon and his fellow bank chiefs’ restraint since the financial crisis. But that may be about to change. Nir Kaissar is a Bloomberg Opinion columnist covering the markets. He is the founder of Unison Advisors, an asset management firm. He has worked as a lawyer at Sullivan & Cromwell and a consultant at Ernst & Young.